Justin G. Schuetz and Alison Johnston at PNAS: “Efforts to mitigate the current biodiversity crisis require a better understanding of how and why humans value other species. We use Internet query data and citizen science data to characterize public interest in 621 bird species across the United States. We estimate the relative popularity of different birds by quantifying how frequently people use Google to search for species, relative to the rates at which they are encountered in the environment. In intraspecific analyses, we also quantify the degree to which Google searches are limited to, or extend beyond, the places in which people encounter each species. The resulting metrics of popularity and geographic specificity of interest allow us to define aspects of relationships between people and birds within a cultural niche space. We then estimate the influence of species traits and socially constructed labels on niche positions to assess the importance of observations and ideas in shaping public interest in birds. Our analyses show clear effects of migratory strategy, color, degree of association with bird feeders, and, especially, body size on niche position. They also indicate that cultural labels, including “endangered,” “introduced,” and, especially, “team mascot,” are strongly associated with the magnitude and geographic specificity of public interest in birds. Our results provide a framework for exploring complex relationships between humans and other species and enable more informed decision-making across diverse bird conservation strategies and goals….(More)”. Ben Paynter at FastCompany: “Several years ago, one of the eventual founders of One Concern nearly died in a tragic flood. 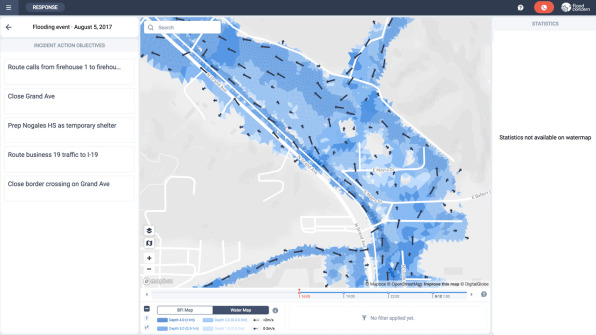 Today, the company specializes in using artificial intelligence to predict how natural disasters are unfolding in real time on a city-block-level basis, in order to help disaster responders save as many lives as possible…. To fix that, One Concern debuted Flood Concern in late 2018. It creates map-based visualizations of where water surges may hit hardest, up to five days ahead of an impending storm. For cities, that includes not just time-lapse breakdowns of how the water will rise, how fast it could move, and what direction it will be flowing, but also what structures will get swamped or washed away, and how differing mitigation efforts–from levy building to dam releases–will impact each scenario. It’s the winner of Fast Company’s 2019 World Changing Ideas Awards in the AI and Data category. So far, Flood Concern has been retroactively tested against events like Hurricane Harvey to show that it could have predicted what areas would be most impacted well ahead of the storm. The company, which was founded in Silicon Valley in 2015, started with one of that region’s pressing threats: earthquakes. It’s since earned contracts with cities like San Francisco, Los Angeles, and Cupertino, as well as private insurance companies…. One Concern’s first offering, dubbed Seismic Concern, takes existing information from satellite images and building permits to figure out what kind of ground structures are built on, and what might happen if they started shaking. If a big one hits, the program can extrapolate from the epicenter to suggest the likeliest places for destruction, and then adjust as more data from things like 911 calls and social media gets factored in….(More)”. influence on current affairs. Given the disconnect between people who are currently living and those who will inherit the planet left for them, individuals who are currently alive tend to be more oriented toward the present, posing a fundamental problem related to sustainability. an option that promoted sustainability. In contrast, when the imaginary future generation was not salient, only 28% of participants chose the sustainable option…(More)”. Jonathan D. Paul in Frontiers in Earth Science: “Pluvial flooding can have devastating effects, both in terms of loss of life and damage. Predicting pluvial floods is difficult and many cities do not have a hydrodynamic model or an early warning system in place. Citizen science and crowdsourcing have the potential for contributing to early warning systems and can also provide data for validating flood forecasting models. Although there are increasing applications of citizen science and crowdsourcing in fluvial hydrology, less is known about activities related to pluvial flooding. Hence the aim of this paper is to review current activities in citizen science and crowdsourcing with respect to applications of pluvial flooding. Based on a search in Scopus, the papers were first filtered for relevant content and then classified into four main themes. The first two themes were divided into (i) applications relevant during a flood event, which includes automated street flooding detection using crowdsourced photographs and sensors, analysis of social media, and online and mobile applications for flood reporting; and (ii) applications related to post-flood events. The use of citizen science and crowdsourcing for model development and validation is the third theme while the development of integrated systems is theme four. All four main areas of research have the potential to contribute to early warning systems and build community resilience. Moreover, developments in one will benefit others, e.g., further developments in flood reporting applications and automated flood detection systems will yield data useful for model validation….(More)”. Victoria Moody at the UK Data Service: “The 2015 Lancet Commission on Health and Climate Change—which assessed responses to climate change with a view to ensuring the highest attainable standards of health for populations worldwide—concluded that “tackling climate change could be the greatest global health opportunity of the 21st century”. The Commission recommended that more accurate national quantification of the health co-benefits and economic impacts of mitigation decisions was essential in promoting a low-carbon transition. Jason Samenow in the Washington Post: “In a month, the National Weather Service plans to launch its “next generation” weather prediction model with the aim of “better, more timely forecasts.” But many meteorologists familiar with the model fear it is unreliable. The introduction of a model that forecasters lack confidence in matters, considering the enormous impact that weather has on the economy, valued at around $485 billion annually. The Weather Service announced Wednesday that the model, known as the GFS-FV3 (FV3 stands for Finite­ Volume Cubed-Sphere dynamical core), is “tentatively” set to become the United States’ primary forecast model on March 20, pending tests. It is an update to the current version of the GFS (Global Forecast System), popularly known as the American model, which has existed in various forms for more than 30 years…. A concern is that if forecasters cannot rely on the FV3, they will be left to rely only on the European model for their predictions without a credible alternative for comparisons. And they’ll also have to pay large fees for the European model data. Whereas model data from the Weather Service is free, the European Center for Medium-Range Weather Forecasts, which produces the European model, charges for access. But there is an alternative perspective, which is that forecasters will just need to adjust to the new model and learn to account for its biases. That is, a little short-term pain is worth the long-term potential benefits as the model improves…. The Weather Service’s parent agency, the National Oceanic and Atmospheric Administration, recently entered an agreement with the National Center for Atmospheric Research to increase collaboration between forecasters and researchers in improving forecast modeling. In addition, President Trump recently signed into law the Weather Research and Forecast Innovation Act Reauthorization, which establishes the NOAA Earth Prediction Innovation Center, aimed at further enhancing prediction capabilities. But even while NOAA develops relationships and infrastructure to improve the Weather Service’s modeling, the question remains whether the FV3 can meet the forecasting needs of the moment. Until the problems identified are addressed, its introduction could represent a step back in U.S. weather prediction despite a well-intended effort to leap forward….(More). Paper by Ariane L.Beck et al in Energy Research & Social Sciences: “In order to help mitigate climate change and reduce the health-related consequences of air pollution, consumers need to be empowered to make better and more effective decisions regarding energy use. Utilities, government, and commercial entities offer numerous programs and consumer products to help individuals set or reach goals related to energy use. Many of these interventions and products have related apps that use gamification in some capacity in order to improve the user experience, offer motivation, and encourage behavior change. We identified 57 apps from nearly 2400 screened apps that both target direct energy use and employ at least one element of gamification. We evaluated these apps with specific focus on gamification components, game elements, and behavioral constructs. Our analysis shows that the average energy related app heavily underutilizes search engine optimization, gamification components, and game design elements, as well as the behavioral constructs known to impact energy-related decision-making and behavior. Our findings offer several insights for the design of more effective energy apps…. (More)”.